Freestride Trainer FS5i Review by Industry Experts! The Freestride Trainer Fs5i by NordicTrack is On Sale! A New Concept in CrossTraining – Define Your Own Motion and Exercise! Freestride Trainer FS5i is the entry model of the FreeStride Trainers, a technological and ergonomic breakthrough in cross training. 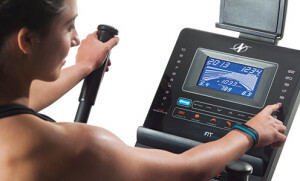 This unique machine design allows for free style and variable motion, which allows for several advantages over the typical elliptical. The FS5i acts like a combination of stair stepper, elliptical trainer, and treadmill so you can work various low body muscles. This motion provides “muscle confusion” resulting in a much more effective workout. We like this model, but feel your money would be better spent on the FS7i or FS9i models that include a longer stride length, heavier flywheels, the ability to adjust incline and more impressive interactive full color display consoles. However, if your budget is limited the NordicTrack FreeStride Trainer FS5i is still impressive. WEEKEND SALE ENDS MONDAY: NordicTrack reduced the price on the FreeStride Trainer FS5i to $999 with Free Shipping and 30-day money back guarantee. This is the lowest they have sold this model. No interest financing available. NordicTrack has made the following changes on the FS5i for the 2019 season. It now has a smaller 5″ backlit display and a 3-year parts warranty. Other than that, things are staying pretty much the same. We definitely recommend you take advantage of the lower pricing on the older machine while it lasts! Variable Motion —The NordicTrack FreeStride Trainer FS5i allows you to define an ergonomic stride path of your own rather than being confined to a set pattern. This prevents your body from adjusting to the exercise so you can cause “muscle confusion.” The motion combines the benefits of a stair stepper, treadmill, and elliptical, working a variety of lower body muscles. The stride length on this machine is 32″ compared to 38″ on the FS7i and FS9i models. Upper Body Workout —Like on an elliptical, handlebars allow you to exercise your upper body. The FS5i has integrated handle controls for ramp and resistance built into the handle bars so you can adjust your workout without breaking stride. iFit Coach Ready— iFit Coach and iFit Coach Plus is an innovative technology only available from NordicTrack and its sister companies. A paid subscription is required for this service. Customized Workouts – With iFit Coach you have the ability to create daily customized workouts based on your fitness goals. These workouts can be progressive and increase with intensity as you improve. The workouts include verbal coaching. You have access to an extensive library of virtual workouts that you can view on the full color display. For example, you can walk the beaches of Hawaii, or hike the mountains of Switzerland, and in the process you get audio coaching. What makes iFit virtual training so impressive is that your resistance on the FS5i will mimic the terrain of the video. Oversized Cushion Pedals – Extra long and extra wide pedals with grooved cushioning are great for a relaxed and stable foot grip. OneTouch Console Controls – The console is well designed and allows you to switch between 22 resistance programs. 7″ Backlit Display – This is nothing too exciting but it works fine. If you are interested in a web enabled color touchscreen, you’ll need to spend more money on the FS7i or the FS9i machines. 16 Lb. Flywheel — A heavier flywheel gives the motion a smooth and natural feel. This is one of the areas where the FS5i and FS7i differ. The FS7i has a 20 lb flywheel. Center Drive — This design reduces the frame size to half the size of a typical elliptical. It also creates greater stability. 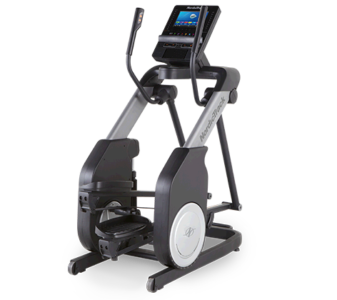 The FreeStride Trainer FS5i is 68″ compared to a machine like the Sole E95 elliptical that is 83″. Incline – The FS5i does not have any incline feature. If you want to incline from 0 to 10%, check out the FS7i. Or incline AND decline -10% to 10% with the FS9i model. Lifetime frame, 5-year parts and 2-year labor warranty. There’s no doubt that the NordicTrack FreeStride Trainer series have some fantastic benefits over typical ellipticals. The unique motion targets more muscles in the lower body providing an effective workout. Plus, the smaller footprint takes up less space in your home and the iFit technology provides great motivation and fitness tracking. While this is a great machine, it might be worthwhile to spend around $500 more for the FS7i. You will be getting an incline feature, heavier 20 lb flywheel, and 7″ Web-Enabled Color Touchscreen. Plus, the stride on the FS7i machine extends 6″ farther for a 38″ length. As for which specific model is better … you should definitely take a look at the FreeStride Trainer FS7i and FreeStride Trainer FS9i. They each offer slightly different features at various prices. Depending on the current sales that are going on, you can even find one of these higher models listed at a lower price! NordicTrack is generally sold only factory direct. Although you may be able to check with your local Sears as they do carry some models of NordicTrack. NordicTrack does offer a few of their models in Sears but they typically are different than the ones sold online. Sears is the only retail store that offers NordicTrack. Bought the FS5i and the resistance is very strong, even at the lowest setting. My wife cannot use it. Is there some way to fix this? Or does it break in over time? You may want to check with customer service at NordicTrack as the resistance level can be adjusted to be very low. It shouldn’t be “stiff”. Most steppers and ellipticals I have tried have handlebars that require me to bend forward a bit. This puts strain on my back. I am wondering if this requires a bit of forward leaning. I am 5’4″, not very short, and not overweight, but find this positioning very uncomfortable. Also, do they offer in home assembly? Is there a return option and at what cost to ship it back? You are correct in that most ellipticals you have to lean forward (which I do not like). Precor is one of the most uncomfortable I’ve been on, Life Fitness (at our gym) are the most comfortable for me. The F7Si to me functions more like the Life fitness elliptical I’m used to and does not require you to lean forward in an awkward position.